If your Platte County company is holding a hiring event, please contact Stephanie Deppen so we can share the details on our website. New to the area or looking for a job? The following companies are currently hiring! Clark | Weitz | Clarkson (CWC), a member of the Edgemoor Team, is the construction joint venture designing and constructing the new KCI Airport Terminal. The development of the new terminal will enhance Kansas City’s world-class reputation by adding a world-class airport that will spur economic development, increase the long-term capacity of M/WBE and local firms, and build the workforce of the future. Currently CWC is looking to fill a position for a KCI Workforce Director who will administer and monitor a pre-apprenticeship training program. Click here for the job posting with a complete description. 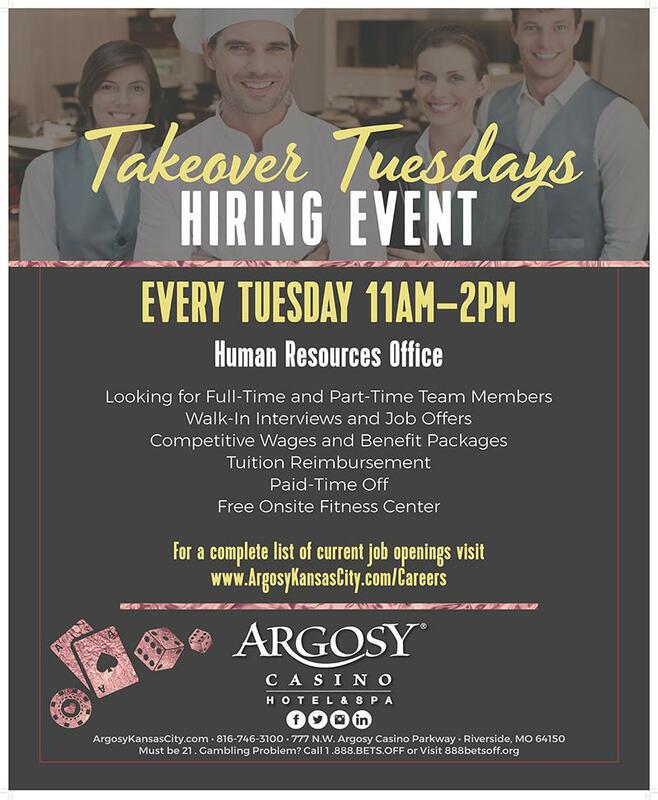 To apply for open positions at Argosy Casino Hotel & Spa, click here. We partnered with TeamKC and KCSmartPort to connect recently displaced talent with area employers in response to Harley-Davidson’s layoffs at its Kansas City plant. 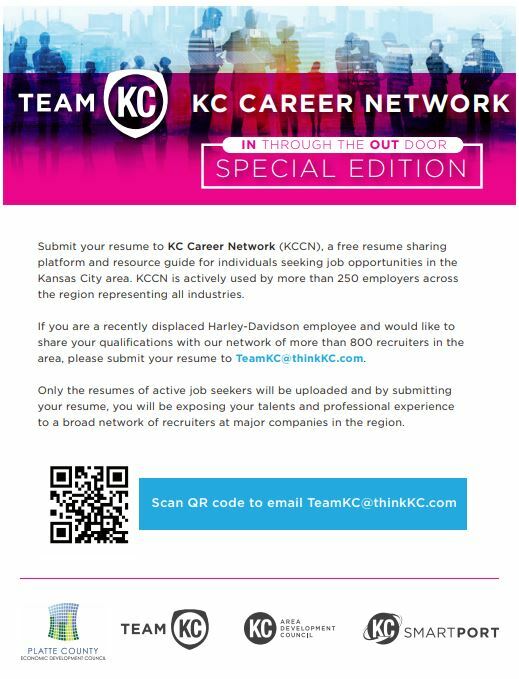 Check this post for info on employers that are actively hiring and the KC Career Network. Adient is a world-class automotive seating supplier. Click here to view company listings. Affinity Worldwide is a family of companies and 50+ operating divisions spanning a broad spectrum of industries. We are real estate investors who established strong roots in the REI industry by becoming the premier provider of insurance, services, publishing and resources for investors. A pharmaceutical sourcing and distribution services company. Argosy Casino Hotel & Spa is a full service, Las Vegas style casino. Aviation Technical Services is one of the largest third-party, transport aircraft maintenance, repair and overhaul (MRO) providers in North America. A global manufacturer and marketer of replacement parts, equipment, and accessories for the forestry, lawn, and garden; farm, ranch, and agriculture; and concrete cutting and finishing markets. Click here to view the Kansas City, MO listings. True Blue® for over 125 years, Capitol Federal® is proud of its long history of strength, security and stability for both our customers and our employees. As a leading residential lender, CapFed® offers convenient banking and mortgage solutions for its customers across Kansas and Missouri. A leading global Tier 1 supplier of complex safety-critical assemblies and engineered metal formed products to the automotive industry. CVS is helping people a million times a day on their path to better health—from advising on prescriptions to helping manage chronic and specialty conditions. Because CVS is present in so many moments, big and small, they have an active, supportive role in shaping the future of health care. Equity Bank is a full-service bank in Missouri & Kansas. Embassy Landscape Group is a multi-disciplinary landscape architecture, construction and maintenance firm. A full-service, upscale, all-suite hotel that provides best in class customer service to it’s guests. Evolytics is a team that thrives on inspiring people to use data in ways that make a difference in the world. Evolytics is passionate about helping global brands develop analytics capabilities that increase revenue, increase operational efficiencies and increase customer satisfaction – all while nurturing innovation. First Transit, Inc. supplies precision, efficiency, innovation, and all-around expertise to both public and private transportation systems. HMSHost is part of the world’s largest provider of food and beverage services for travelers. Jet Midwest is a global, multifaceted, aircraft service provider. Jet Midwest specializes and operates as a full-service commercial aircraft, engine and spare parts trading, offering complete end-of-life and creative product support solutions. Johnson Controls is a global diversified technology and multi-industrial leader. Customized technology solutions and services for K-12 school districts. A leader in the production of quality steel and aluminum metal parts, assemblies and modules and fluid management systems focused primarily on the automotive sector. Multivac is the leading manufacturer worldwide of thermoforming packaging machines. Orange EV is a Kansas City, Missouri original equipment manufacturer (OEM) that makes heavy duty electric vehicles that are better for the earth. Premium Waters is a water bottling plant. An eCommerce company that specializes in the customer experience. Is a leading global provider of fishing tackle, lures, rods and reels. Senior Star at Wexford Place strives to provide excellent service and care for those in their community. Their services include, independent living. assisted living and memory support. Works with local farm families to secure the best quality pork. Tiffany Springs Rehabilitation & Health Care Center exemplifies the highest standards in senior living and wellness design, offering short-term rehabilitation services and extended stays. UGA is a leader in providing financing and servicing for unsecured lending in key verticals, including Education, Medical, Membership and Consumer Goods. Plastics manufacturer supplying the automotive industry. Technology installation and deployment company focusing on a wide range of technology solutions. Vistar delivers quality national and regional name brand products. One of the nation’s largest/leading providers of candy, snacks, beverages, and other convenience food items. YF USA is a manufacturer of Door Panels, Floor Consoles, Instrument Panels, and Garnish Trim for major OEMs in North America. YMCA of Greater Kansas City is a charitable organization committed to strengthening communities. Of all the counties in the KC Metro area, only Platte County offers direct airport access, as we are home to the Kansas City International Airport. Our workforce also has direct access to several interstates and major highways; I-435, I-29, I-635, 169 HWY, 9 HWY, 152 HWY and quick access to I-35.